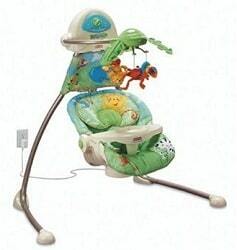 Amazon currently has the Fisher-Price Rainforest Open Top Cradle Swing for $90.47. That's 38% off the list price of $145, plus shipping is free! Both Haiden and Piper used this same swing when they were babies. I have to say the hands-down best feature ever was the power cord. It was a huge bonus to not have to worry about the added inconvenience and expense of batteries!